When I was a new teacher, I came home tired. Dead tired. My husband wanted to support me, to treat me, so he would offer to take me out to eat for dinner. Yes, dear readers, the thought of even having to choose between one of 5 choices of restaurants in our small town Overwhelmed me. First world problem, yes. But why did I react so strongly? An instructional day with a constant stream of choice after choice. To copy or not to copy, that was the question. I feel for today’s teacher even more than I emphasize with my old teacher-self. I didn’t have Google, Facebook, Pinterest, and Teachers Pay Teachers to contend with. These platforms are dreamy in terms of possibilities. They can also feel deathly when we have too many decisions to make. Indeed, a recent study calculated that teachers have to choose among at least 205 trillion instructional options. That, ah, could be, ah, considered challenging! 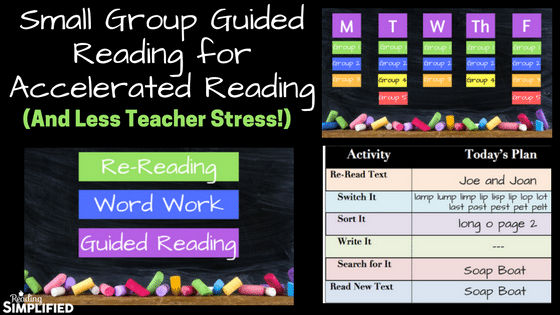 To combat decision fatigue, AND to help you accelerate all of your readers’, I propose a small group, guided reading structure that has served me well for nearly 20 years. I’ll then describe how one teacher might use this structure to plan lessons for 2 different groups. I’ve used this structure as a tutor with hundreds of children, ages as varied as 3 to 15. It’s also similar to the structure of an early intervention called the Targeted Reading Intervention I developed at the University of North Carolina that had significant impact on all reading measures (decoding, word identification, spelling, and comprehension) as reported in these studies: (study 1, study 2, study 3, & study 4). 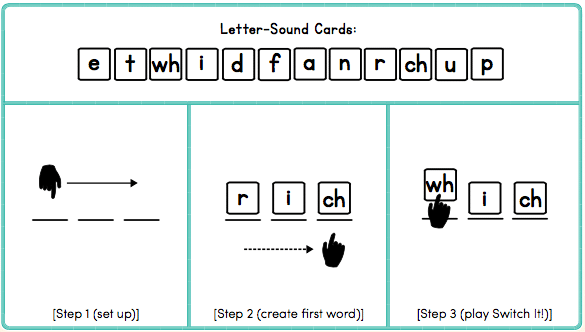 Phonemic awareness (perception of individual sounds in words, i.e., “much” = /m/ /u/ /ch/). Multisyllable strategies, such as Blend As You Read by Chunk. Guided Reading is when the students take turns reading aloud a challenging text that builds their decoding and word identification skills. The teacher offers word-level support and comprehension support where necessary. Finally, students conclude the small group session summarizing what they read and preparing to work independently with their targeted sound (such as /oa/) and texts for re-reading practice. The mission of this small group structure is to move ALL students to rapid acquisition of independent reading. Once kids can reading independently and enjoy reading for its own sake, then other structures may be beneficial, such as literature circles, genre study, book clubs, research studies, etc. But that’s a post for another day. 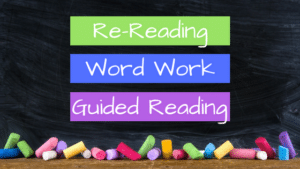 Most K-3 students, as well as struggling students, however, would benefit from the above structure to efficiently advance their reading skills and enjoyment. 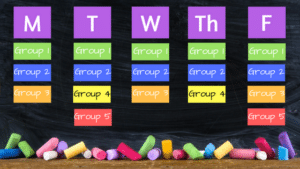 Thus, a teacher using this structure doesn’t have to decide what to do at the beginning, middle, and end of every 20 minute interaction with every group. Instead, she has a framework that hits the most important tasks of early literacy and adapts them to each group’s particular needs. Imagine a teacher. We’ll call her Ms. Peregrine. Ms. Peregrine teaches 1st grade and has 5 groups of students for her small group guided reading time. She sees 2 of these groups every day; two of these groups every other day; and the final group 1-2 times per week. 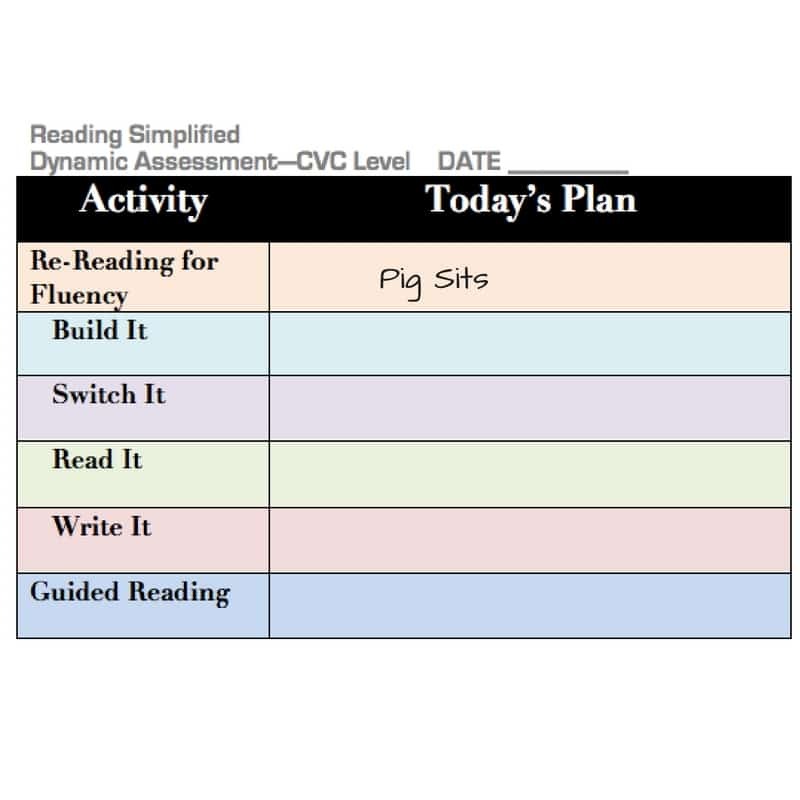 She begins making notes in her small group planner for Group #1, AKA the “gymnasts.” Based on her initial assessments of their reading achievement, they are at the Kindergarten reading level. She has placed them at the earliest CVC step and have just been exposed to short a and short i. They have good comprehension of text read aloud to them. Her main objective is to rapidly provide them the foundation of strong decoding skills so they can learn to recognize words easily, become fluent, and learn to love to read independently. So, on the Reading Simplified Streamlined Pathway for Kindergarten level readers, this puts them at the first CVC level. Using the Streamlined Pathway, coupled with the simple structure I’m presenting today for small group guided reading, a teacher can diagnose and plan small group and independent work more easily and with less effort. Despite this time savings, she can also expect to see students reading achievement outcomes accelerate! First, what will she select for Re-Reading for Fluency? 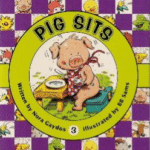 She just adds the name of yesterday’s Guided Reading text, “Pig Sits” by Nora Gaydos to the Re-Reading for Fluency box because she had the gymnasts group re-reading it in pairs yesterday after their time with her. Most of them should be able to read this short text fairly well to her now. A little more time to think. Yesterday Ms. Peregrine observed that everyone was much more reliable with their knowledge of the short a sound but they were still only 50-50 with the short i sound. 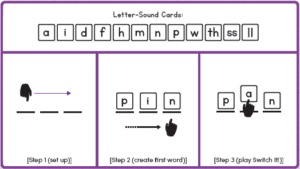 And, phoneme manipulation (practiced in activity Switch It) with 3-sound words was still mostly a struggle. So, she opts for “Switch It” first and chooses a word list that targets short a and short i (the only short vowel spellings they’ve been exposed to.) But they can usually phonemically segment 3-sound words already and know essentially all consonants, so she can skip Build It from now on. She also noted yesterday that Frank had advanced in his 3-sound word blending, but he still wasn’t independent without her coaching. The rest of the students still needed her support about 1 time during the lesson. 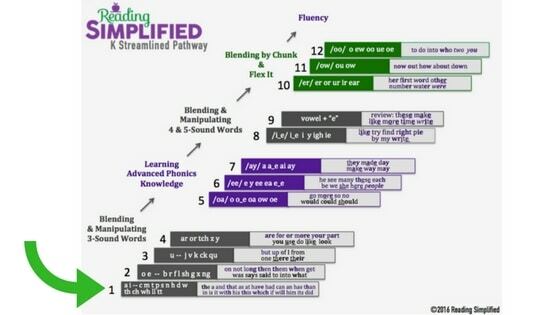 So, Blend As You Read with CVC words should still be a goal for this group. Thus, using the Streamlined Pathway to guide her, she writes in Read It words: has will with this. This Read It list focuses on mostly words with continuant consonants, which are easier to blend, are on the students’ target sound needs: “i” and “th,” and are Fry high frequency words with the same vowel sound. Finally, since she has already determined that blending 3-sound words and learning the short i sound are the most pressing needs of the gymnast group, Ms. Peregrine flips through her short i CVC tub of books and selects 4 copies of the “Big Hit,” by starfall.com. Now she’s ready with a great plan for her most struggling group of readers. Now our brave heroine is ready to plan for her other daily group, the Swimmers. This group tested at the early 1st grade level, so Ms. Peregrine has placed them at the second step of the 1st grade Streamlined Pathway. 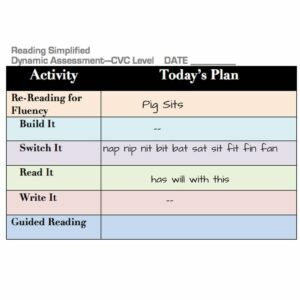 Their Blend As You Read strategy is developing well with CVC words. 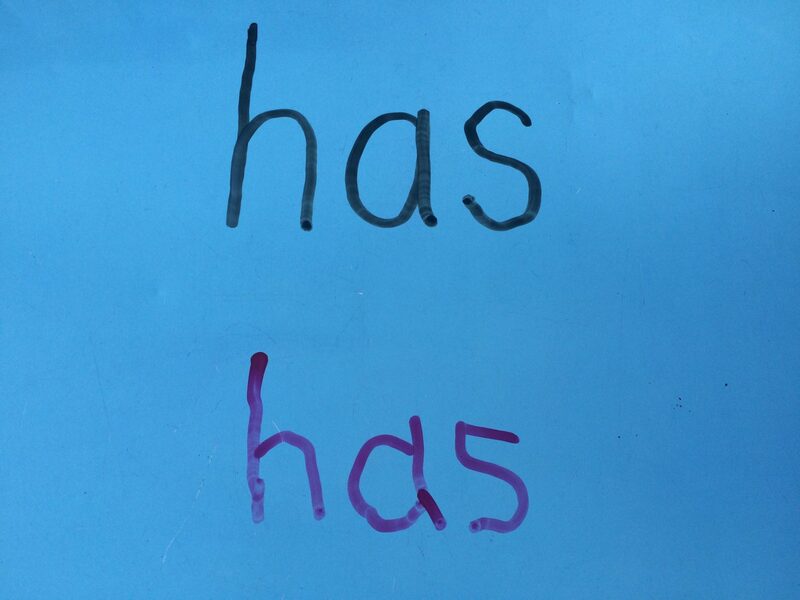 They know several high frequency words, too, but not all that would be expected for her school for early 1st grade. Comprehension of text read aloud to them is good. 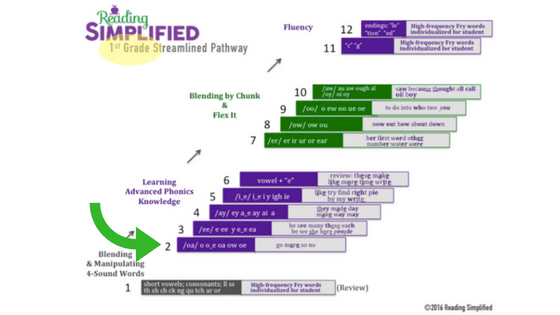 (All students are sorted into 1 of 3 Streamlined Pathways: K, 1st Grade, or 2nd Grade and Up. Yes, I’ve even taught struggling high school students and an adult who was functionally illiterate with a pathway like the 2nd Grade and Up one. By just having 3 Pathways to choose from, Ms. Peregrine minimizes The Overwhelm. These 1-pagers are a lot simpler than endless standards, basal scope and sequences, district guidelines, etc., that she used to stress over. And, yet, students learning to read quickly will be more likely to happen with this approach. Like with the gymnasts group, Ms. 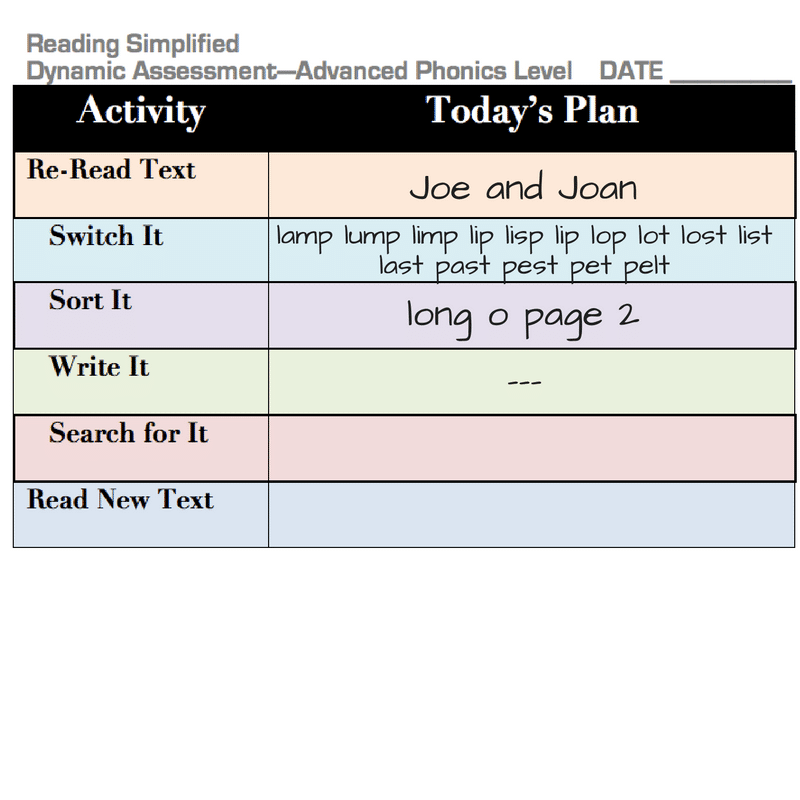 Peregrine easily chooses the Re-Reading for Fluency text from yesterday’s Guided Reading selection, “Joe and Joan” from the Reading Simplified Academy. The swimmers just began Advanced Phonics instruction, specifically with the long o sound and its major spellings. They read “Joe and Joan” yesterday with her support and then she read it to them twice as they followed along. They also read it as partners during literacy stations. So, they should be pretty fluent at this short story by now. 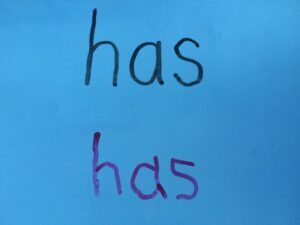 Next up, what will she do for Word Work? At the Advanced Phonics level, her decisions are pretty easy for planning Word Work. She aims to practice the long o sound all week, during Guided Reading as well as literacy stations, and for homework reading. Since they just got started learning the Sort It activity, it’s good to reinforce it with a new list of words. Practicing their phonemic awareness (especially phonemic segmentation) as they Say Each Sound As They Write Each Sound. In addition, Ms. Peregrine is still concerned about their inconsistencies with their short vowel knowledge and their phonemic manipulation. They are pretty successful at the CVC level but she wants to challenge them with CVCC words. Finally, she’s ready to select a new text for Guided Reading. 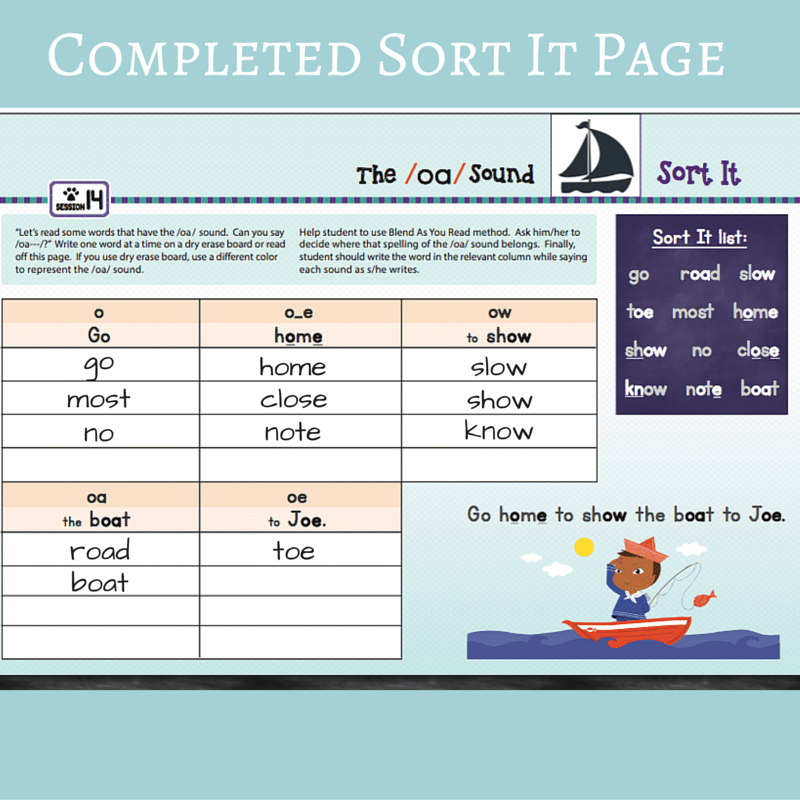 She looks through her tub of long o books and selects an easier one, with less text–“Soap Boat” from starfall.com. 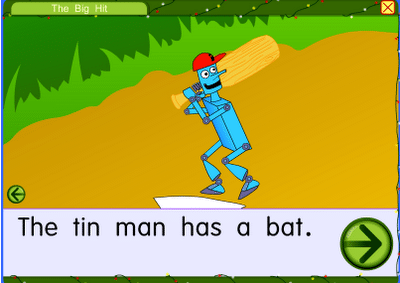 Besides this bei ng a good match for early 1st graders just beginning to get the concept that one sound can have multiple spellings, starfall.com also offers interactive elements to reading this book online. She’ll send her swimmers group off to the computers to practice re-reading “Soap Boat” on their own. They’ll enjoy it and find re-reading easy. 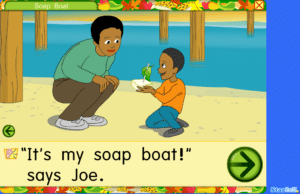 Before that however, she’ll try to save time in their small group to also do Search for It after they read “Soap Boat.” She has paper copies of the book that each child can keep because starfall.com offers 20 texts for about a buck. 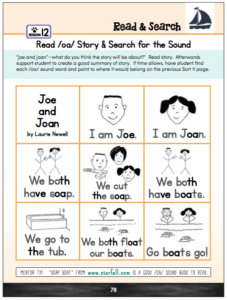 Each child will search for the long o sound in the book and circle that spelling. 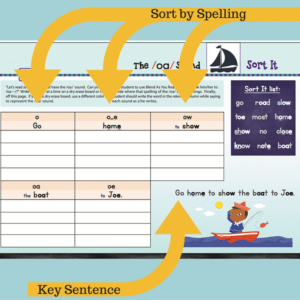 If time allows, they can point to where each spelling belongs on their already completed Sort It page. Just like with Group 1, the gymnasts, Ms. Peregrine has again swiftly planned for another small group guided reading session. Now she has time to watch This Is Us! Would you like to simplify your guided reading instruction, too? Imagine if you were to plan like this. What might be the biggest benefit to you or your students? Please comment below so we can continue the conversation! How do I do guided reading with J.k. Students who don’t know the names of the letters or their sounds? I also Buddy Read simple, mostly decodable texts. In other words if they just began learning the sounds for “m,” “a,” “t,” “s,” and “p,” I would let them read words with those sounds such as “map,” “mat,” “sat,” etc., in every sentence we encountered. But the rest of the sentence I would read to them, encouraging them to read along. 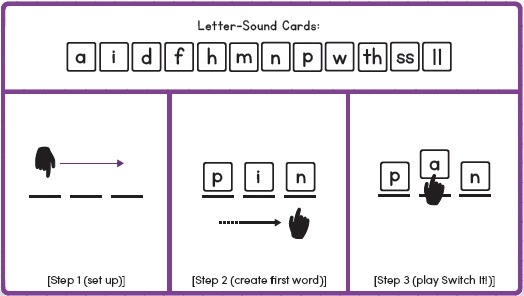 The biggest trick with the newbies is to dive right into teaching them letter-sounds and phonemic awareness and decoding all at once, in the context of words, with the 2 activities above. Good luck! Could you suggest how to use these techniques in a rotation sequence? I teach a combined 1st and 2nd grade class so I need to be able to work with one group while others are doing independent practice. 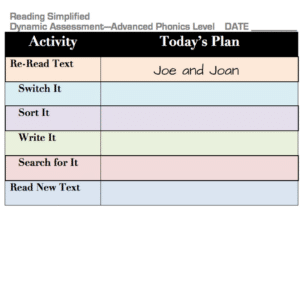 Much of the build it, switch it style activities require a teacher, so I can not do those as I also meet with a reading group. 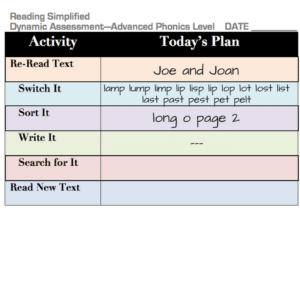 Any suggestions for independent work for 1st or 2nd while I meet with the other grade to work on either the reading group or the build it, switch it style activities? Great question, Courtney! I’m going to be writing about this very soon. –picture word building. 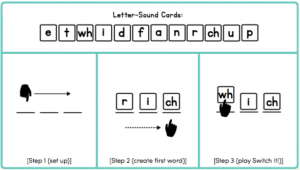 Students find a picture and build the word themselves using letter-sound cards. The back of the card could have the “answer” for self-correcting. –Build a chain. Cut slips of papers for building a word chain. Have a scrambled list of words that could make a chain of 1 switch per word. 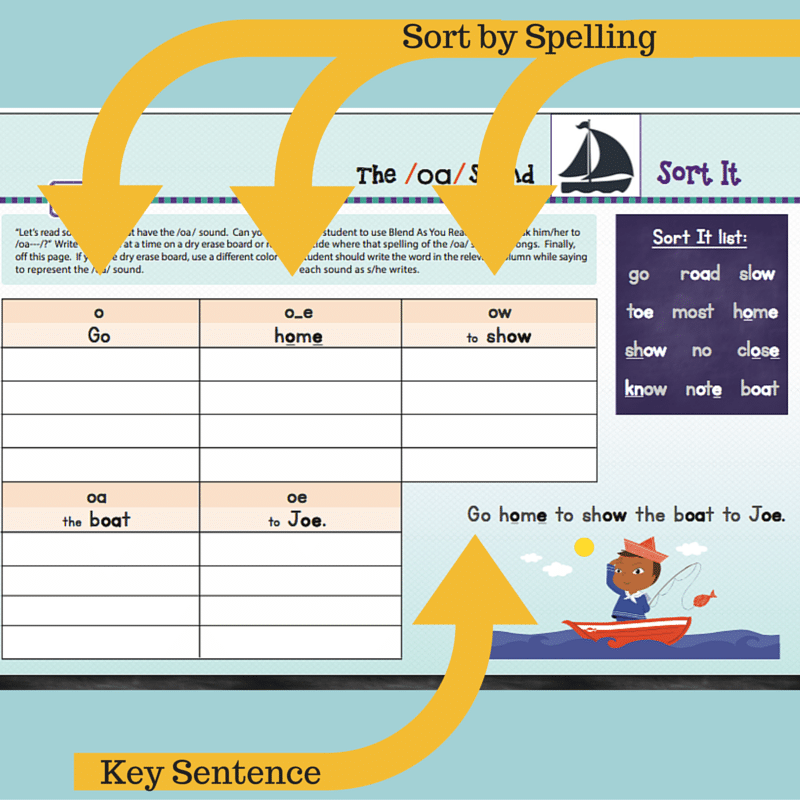 Let students Write and Say each word as they write it on the paper slip. Then they put them in order and make a paper chain. 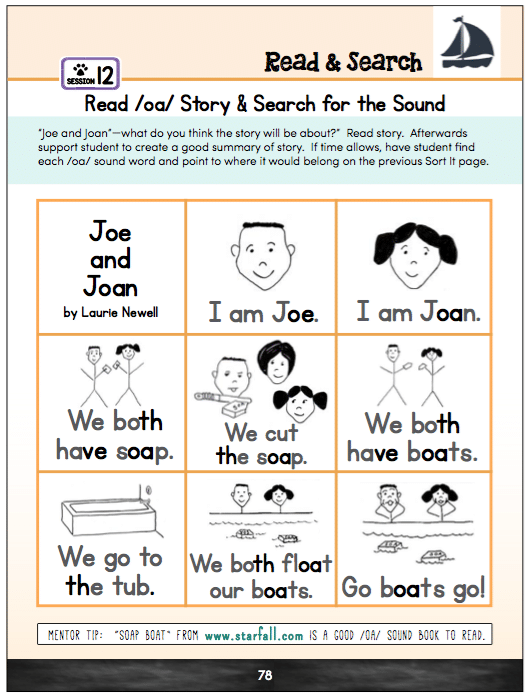 For Independent centers/stations, choose word difficulties slightly below where you work with them for guided reading. For instance, if they can Switch It with CVCC words but not CCVCC with you, then the center should probably mostly be CVC level words. I would have these centers be constant in the classroom. Each group would choose different level of words or levels on the apps, depending on where they were along the Streamlined Pathway. Hope this helps, Courtney!! I’ll have more energy to help teach & guide my students while ensuring I am covering the essential activities to accelerate their reading! 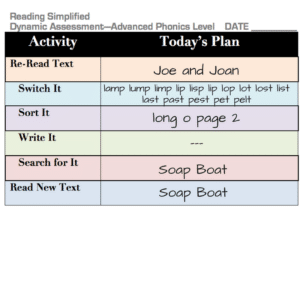 I have a group of intensive and a group of strategic third grade students that are on level G and K. I would like to bring their reading levels up to M/N what can I do? Barbara, I’m sorry to hear about these challenges but glad you’re here for a solution! I know with the Reading Simplified system, you can do it. Oh my goodness! As a special ed. teacher, I cannot even imagine how much time and stress your academy could save for me! 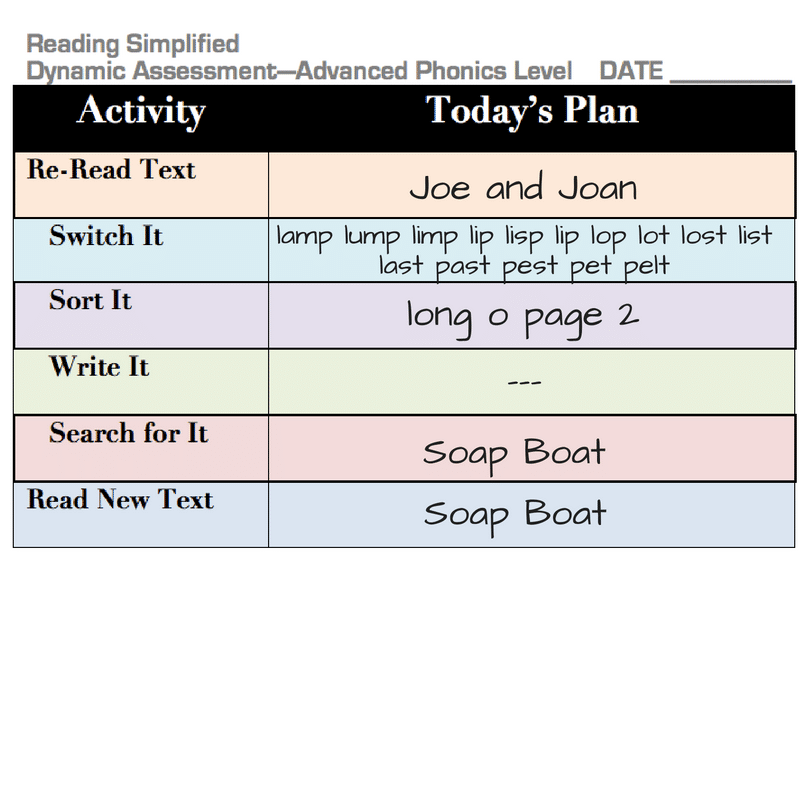 I teach 3rd and 4th Grade students, but their reading/spelling/writing levels vary from preprimer to 4th Grade. I have a huge caseload this year and feel like I am drowning! ? I have kids coming and going from different classrooms and specialists, so I rarely have the same groups of kids. Julie, that IS an impossible job with traditional methods. 🙁 I DO believe we could help streamline your instruction and give a clearer vision for where everyone can be. We’re hosting a special challenge this week and will open up the Reading Simplified Academy to all at the end of that challenge. If you’re not already signed up for the challenge, join here: ReadingSimplified.com/level-up If you aren’t doing the challenge, keep an eye out for an email from us on Fri. (if you’ve gotten any gift in email from us you’re on our list).